Our Chapter is hosting Village. Volunteer opportunities! OUR CHAPTER WILL HOST A VILLAGE NEXT SUMMER !!! In December, around 30 kids and chaperones gathered for our yearly cookie-a-thon. They had fun activities and baked cookies to donate to The Breathing Room Foundation,an organization that provides comfort to families affected by cancer. The CISV theme for 2019 is Conflict and Resolution. participants work around this theme. including activities that were designed by a group of international JBers. At our January meeting, our JB board created an activity on that theme. RMC (Regional Mini Camp) is coming very soon, and we want YOU to be there! While we are not part of the North East Region anymore, we are now part of the Mid-Atlantic region (Philly, BV, D.C., and Pittsburgh chapters), meaning that we will be having the first ever Mid-Atlantic RMC! Registration information will be coming out very soon, so make sure to check your emails for any updates! However, we are sending out a Pre-Registration (provided down below)! We have a limited number of spaces for this RMC, so if you are interested in attending you must pre-register through the link below. This is a first-come/first-served system. We also need 21+ adults to chaperone, and chaperones should pre-register as well. Note: This is merely a pre-registration, but is mandatory if you want to attend–payment and forms will come with the real registration. Seminar Camp applications are available on our website http://philly.cisvusa.org/ the application lists the available camps and how to apply. Opportunities to lead and staff different programs. Look at pictures and stories from our Chapter Mini-camp! Thank you to our awesome JB board and JB advisor for a great mini camp! Chapter Mini Camp was an incredible bonding experience with the rest of my chapter. I got to see old friends, strengthen bonds with others and create bonds with new people. The activities were eye-opening, well structured, organized and fun. My favorite activity was the Planetarium Activity and also the Casino Silent Activity. The Planetarium Activity was a three-stage activity where we had to observe, interact and assist an alien culture meet their objective so they would give us fuel so we could get back to earth. The casino silent activity was a dice game with movements depending on the group. I learned how to respond to different situations and solve problems in diverse situations with people who were different from me. Both were really well developed and expertly executed as were all of the activities we did at CMC. By chaperone Alena Abrosimova, mother of Alex, 10. Both Alex and I were impressed with the camp and what JB team was able to accomplish in a day and a half. All of our chaperons and JB advisor Fatima were absolutely great. We had many nice discussions and shared a lot of useful tips and information with each other. It is time to renew your MEMBERSHIP for the year 2018-19! Just click on the button above. This meeting will be Tuesday, Oct 2, from 7:00 to 9:00 pm at the Spindlers home. KIDS AND CHAPERONES. BRING FRIENDS! Mini Camp is for youth ages 10 and up. This is a great opportunity to learn about CISV camp activities, make new friends, have great discussions, and enjoy lullabies and energizers. Don’t miss this mini camp! Bring your friends, as this is a great opportunity to introduce them to CISV. We will have a table to promote CISV at COMMUNITY FAIR at George Washington High School on Saturday, September 29, 2018. Philadelphia Mayor Kennedy will attend, so we expect the media to be there around 11:30am. Thanks to our JB advisor, Fatimah Mitchell, for putting this together. If you are able to attend and help Fatimah, please contact her at fmitchell0701@gmail.com or by phone 215-237-4948. JB leaders were at a street fair in Horsham recently and talked with 250 people about CISV! We had awesome leaders for our Village in Dallas, Interchange programs with Austria and Brazil, and for our local Step Up program here in Philadelphia. Parents and friends pitched in to pick up Step Up participants at the airport, host the two weekends, find donations, and ensure a fun, educational and safe experience of all involved. And in 2019 we’ll have a chance to do this again when we host Village. 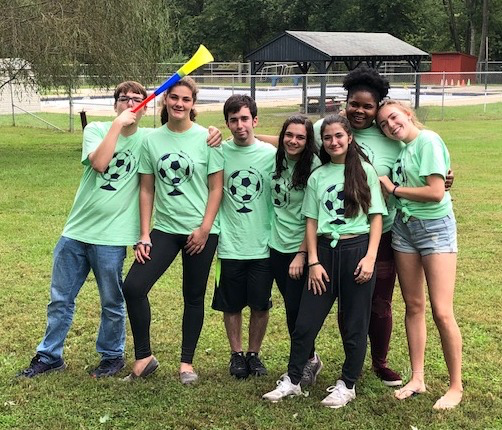 CISV is only possible through the outstanding efforts by both adult and JB leaders as we host programs, create selection committees, hold fundraisers, promote the program in schools, and reach out to amazing young adults who get trained as leaders and get to know our kids. Chris and Carolyn Davis took charge as Co-Presidents for 2017-2018, and Sabine Oberach is our Chapter President for this year with support from many others. Sign up as a Step Up Host! Get more info about hosting here. Leader Opportunities – Apply Now!